Risk taking is often viewed in a negative light. The concept evokes images of individuals engaged in reckless behaviours (e.g., car racing, skydiving, drug use) that have a high probability of negative consequences to the risk-taker’s health or life. Much of the research into risk taking has aligned with this negative stereotype, emphasizing adverse outcomes and need for controls over such activities. Although risk is often associated with negative outcomes, the process of risk taking is motivated by anticipated positive outcomes. In a study I conducted recently, I explored how psychological benefits motivate risk taking. I examined how adult skydivers make sense of their skydiving experience and how the experience of skydiving differs between individuals with and without symptoms of Attention Deficit/Hyperactivity Disorder (ADHD). The sport of skydiving was selected as it is a so-called “extreme sport” involving physical activity that carries a risk of serious physical injury and death. ADHD, a disorder characterized by inattention, hyperactivity, and impulsivity, was selected as it is often associated with risk taking behaviours. The study identified five themes and fifteen subthemes of motivations for participation in skydiving. Identity. Identity refers to the conceptualization and expression of a sense of self and the nature of one’s existence in the world. Achievement. Achievement refers to one’s ability to successfully complete something one strives to attain. Self-Esteem. Self-Esteem refers to one’s feelings of worth, respect, or positive impression of oneself. Social Context. Social Context refers to the degree of acceptance, integration, and sense of belonging an individual has within a community. Status. Status refers to the relative social standing an individual has compared to others. Risk Taking. Risk Taking refers to participation in an activity that involves the potential for an undesirable consequence in order to achieve a specific goal. Risk Management. Risk Management refers to the forecasting and evaluation of risks combined with the identification of procedures to avoid or minimize the potential consequences of those risks. Control. Control refers to the ability to influence or direct a course of events. Boredom Susceptibility. Boredom Susceptibility refers to the “aversion to any kind of monotonous conditions and restlessness when confined to such conditions” (Zuckerman, 2007). Individuals with high boredom susceptibility dislike repetition, routine, and people or situations that are not stimulating. Disinhibition. Disinhibition refers to “seeking sensation through other people, a hedonistic lifestyle, ‘wild’ parties, sexual variety, and drinking to disinhibit” (Zuckerman, 2007). Experience Seeking. Experience Seeking refers to “seeking sensations and new experiences through the mind and the senses (e.g., music, art, travel) and through a non-conforming general lifestyle with likeminded friends” (Zuckerman, 2007). Thrill and Adventure Seeking. Thrill and Adventure Seeking refers to a “desire to engage in physical activates that provide unusual sensations and experiences, such as mountain climbing, skydiving, or scuba diving” (Zuckerman, 2007). Sense of Well-Being. Sense of Well-Being refers to how individuals evaluate their lives with respect to the state of being comfortable, healthy, or happy. Experience and Management of Stress. Experience and Management of Stress refers to intentional participation in activities that are stress inducing and the actions taken to effectively cope with that stress experience. Psychological Dialectic. Psychological Dialectic refers to an experience of tension or opposition of two interacting psychological experiences resulting in mental or physical incongruities between simultaneous experiences (e.g., beauty of a natural setting with the stress of a strenuous activity). This study found that motivations for participating in the sport differed for skydivers with and without a diagnosis of ADHD. While individuals diagnosed with ADHD appeared motivated to participate in skydiving by the desire to seek a sense of well-being, individuals who were not diagnosed with ADHD appeared more motivated by a sense of achievement. Individuals experiencing ADHD integrated the experience of risk taking into their identity, which resulted in a greater sense of well-being. 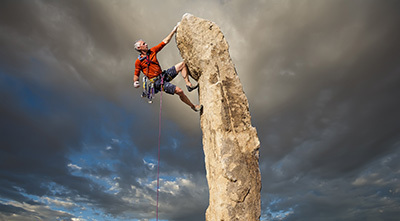 Risk taking and identity integration is intrinsically driven as successfully pushing mental and physical limits promotes self-worth and results in unique achievements. Individuals not experiencing ADHD were primarily goal driven in their participation in the sport. Growing an extensive set of technical knowledge and skills permits these individuals to more effectively eliminate or avoid risk which, in turn, allows them to accomplish further goals within the sport. These notable thematic differences suggest that skydiving is primarily a replaceable hobby for individuals who do not experience ADHD while for those who do experience ADHD skydiving is an irreplaceable aspect of how they define themselves. The results of this study challenge the negative stereotype of risk taking including the assumptions that psychological health requires physical safety and that risk taking is a sign of mental or behavioural disorder. Behaviours that have often been described as reckless or impulsive in the literature on sensation seeking and risk taking appear to have psychological benefits for some individuals. Despite the potential negative consequences, risk taking dramatically improves the lives of some individuals.